Relaxing in warm water makes a huge difference! Not only will you have warmer swimming pool all summer long, but you will also begin swimming in your pool sooner in the spring and more in the fall. Whether you’re an early morning swimmer or have kids that like to splash in the pool for hours, solar pool heating is the solution! And Solaron of Vacaville installs it! Solar pool heating, compared to other systems, is economical and durable. Spread the cost of getting it out over fifteen years and the cost is incredibly low to heat a pool. And anyone who warms their pool with natural gas or electricity knows that it quickly becomes pricy, both to install a heater and to power it. So if you need to heat your pool, a solar pool heater is the most economical system. Every year days begin to get longer and you think about swimming. But you look at the pool temperature and it’s just too cold for your tastes! A solar pool heater resolves this problem. Once the sun is again robust and shining, you can “pump up” the temperature of a pool. And when people are dragging out their pool cover for the fall and winter, you can just keep swimming for many weeks more. Olympic requirements state that a competition pool has to be kept at 79 degrees Fahrenheit, with no more variation allowed than one degree up or down. Heliocol is installed at Olympic venues to maintain such an exact temperature with technology that turns the pool pump on and off automatically. If extra temperature is required, the pump runs during the day. If cooling is required, the pump runs at night. You too can benefit from specific temperature control by investing in a fully automated Heliocol solar pool heating system. When you choose to acquire a Heliocol solar pool heater, you want the best contractor you can find. 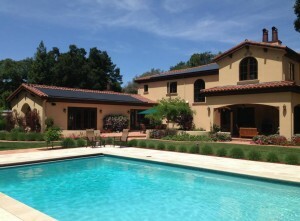 Solaron has the most experience in Vacaville, since we are the #1 installer for Heliocol in all of California. When you think about the large number of swimming pools throughout the state, and the size of its cities, that really means something! Install your solar pool heater with confidence by going with Solaron! Contact us today at 916-631-9293 or online through our website.